Responsible, ethical, caring, self-reliant animal lover fleeing Buffalo winter to care for pets and stay warm. Describing ones self always sounds so forced. I have included references so that you might get a more complete idea. I'm outgoing, conscientious, mature, reliable, well educated, creative, and honest. I enjoy the arts, I’m a voice actor, I volunteer for Habitat for Humanity around the world (the photo with the pups was taken this summer on a build in Alaska when I had the honor of playing with some Iditerod pups!) as well as for several local concerns, and I'm sure you will understand one of the reasons why I want to house sit when you notice where I live (and own my own home): Buffalo, NY. My past love of snow and cold has dissipated and the unexpected loss of my last family member and my long time cat friend last Spring has encouraged me to seek winter warmth and sunshine and live as fully as I can. I have missed my dogs and cats and would love to shower one or two with love. I look forward to taking the creative risk of a new location in a walkable, bike-able area and being of service. I am looking to be of service to others, love a dog(s) and/or cat(s) or in a walkable/bikeable area with a climate warmer than Buffalo, NY. I have taken a leave from my college teaching position for the Spring semester so that I can do this. Yes. I have done dog and cat sitting not only for friends here in Western New York, but also in New York City, Idaho, and Denver. The recommendation letter from canine judge, Kim Alexander Thomson included in this profile should help explain. I have also cared for summer homes on the Canadian Lake Shore. I grew up with large dogs, two at a time, loved it and miss it! Because busy schedules of my adult life could not allow the time necessary to properly care for dogs, I have had two cats since then, each for twenty glorious years. I have owned my own homes for 30 years and know the value of their maintenance. I know the proper common sense fixes and when to call a professional. I bring ethics, honesty, and trustworthiness, common sense, neighborliness, and of course love and care to animals. As a homeowner myself, I am keenly aware of not only the necessity of upkeep, but also the value of a good neighbor. My easy-going nature and outgoing optimism has not only brought me closer to my neighbors, but also helped maintain a strong community. We laugh, saying that we look out for each other, but we don't drink out of each other's bowls. I look forward to helping to do that for you while you are away. Having traveled and lived throughout the world, I much prefer the exploration of place to the tourism of large territory. I love animals, especially dogs! It's a great way to really know a place rather than glaze over it. Being based in Buffalo NY in the summer, I am looking toward warmer climates during the winter months. I am organized,flexible, with a sense of humor - a happy combination. -a good neighbor and communicator -staying in touch by email etc. as often as you would like. 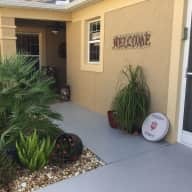 I want to BE there and in the neighborhood, not just use your home as a travel home base, so your pets will have plenty of love and attention. Margo was great. She was very focused on taking excellent care of Carmel. The journal that she left (written by Carmel was terrific. We really enjoyed reading it. Margo kept us informed while we were away and that was very reassuring. All in all a wonderful and successful sit and we would be delighted to have Margo back. Margo looked after our house and cats in California for two weeks while we were on our honeymoon. I can't recommend her more highly! She kept everything very clean, was responsive with communication, and handily navigated our (old / well-loved) house's quirks, leaky windows and all. She even left a cute little journal from the cats' point of view. 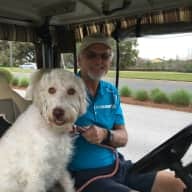 We were a little nervous about leaving our house to a total stranger - this was our first experience with a house sitter we didn't know personally - but it was in great hands with Margo and we would not hesitate to have her back. Thanks, Margo! lives have a void if there is not a pet in them. after their health and they gravitate to her easily. Shell get on the rugs with them and play and play. deal; a genuine pet person. joy, caring and compassion. Could you possibly hope for more? If I can be of more assistance, please do not hesitate to contact me. Margo is super; she has accompanied me on several Habitat for Humanity Global Village builds all around the world. She is very responsible and well liked.